This is a special talk that only uses board and chalk, no powerpoint but yet not a standard lecture! The stability of a pendant drop is discussed. The only scaled groups that govern the stability are the scaled volume and the Bond number. It can be shown without computations that the volume of the drop has a maximum value beyond which it must break catastrophically. However, this upper bound on volume is not the instability limit for the drop for all Bond numbers. There exists a critical Bond number, above which the drop breaks before the upper bound on volume can be reached. We explain how we can find the instability WITHOUT and instability calculation i.e., without solving an eigenvalue problem. 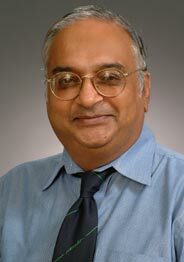 Ranga has also directed two major outer space experiments, designed to confirm theories on the effect of microgravity on crystal quality. These widely publicized space flight experiments were conducted in 1996 and 1997. This research has led to a new and clear interpretation of fluid dynamical patterns seen during convection and the transition of such patterns to near chaos. He continues work on microgravity pattern formation with two prospective experiments on the International Space Station, in collaboration with the Japanese and European Space Agencies. The University of Florida has honored him with a Distinguished Professorship (2013), Edie Professorship (2012), Distinguished Teaching Scholar (2009), Florida Blue Key Distinguished Faculty Award (2010), an International (2012), International Educator of the Year Senior Faculty Award (2012), a UF Research Foundation Professorship (2002), a Chemical Eng. Department Charles Stokes Professorship (2003), two College of Eng. Teaching Awards (1995, 2000), a Professorial Excellence Award (1998) and a Teaching Incentive Program Award (1995).